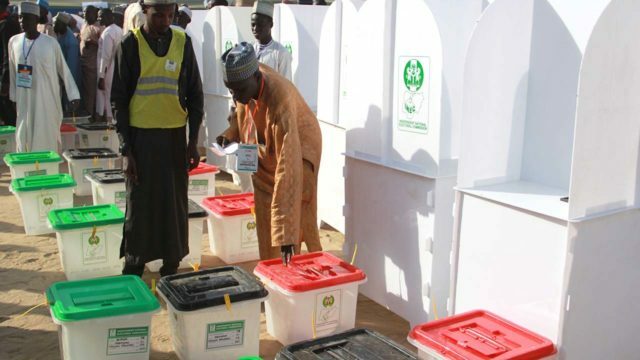 Thousands of Internally Displaced Persons (IDPs) defied the early Saturday morning explosion scare in Maiduguri and came out en mass to cast their votes in the Presidential and National Assembly elections. The News Agency of Nigeria of Nigeria (NAN) reports that there was a large turnout of voters at the Teachers Village’s IDPs in Maiduguri, in spite of the early morning explosion scare. NAN reports that the voters joined queues at various polling units in the camp as early as 8 a.m., while voting commenced at about 9:30a.m. The IDPs’ voters were from Kukawa, Kruss Kawwa, Baga, and Doron Baga communities of Kukawa Local Government Area of Borno. Some of the voters, who spoke with NAN in separate interviews, said that they came out with satisfaction and joy to vote for candidates of their choice. Usman Kachalla, a displaced person from Baga, said he came out to join the queue at 7 a.m.
Kachallah said that the electoral officers and materials arrived on time for the elections. Yagana Bala, another voter, said that the explosion caused panic among the displaced people, stressing that the incident was not enough to dampen their enthusiasm to vote. Alhaji Dan-Baga, also an IDP, appealed to the government to strengthen security at the camp to prevent unsuspected attack by Boko Haram insurgents. “We need maximum security in the camp to enable us cast our votes peacefully,” he said. NAN reports that series of explosions were heard in the Borno capital of Maiduguri on Saturday, just hours before the opening of polls in presidential and National Assembly. Explosion occurred at Teachers Village Internally Displaced Persons (IDPs) Camp, Bolori and Pompomari areas of Maiduguri, with no casualties recorded. However, there was no immediate indication of the cause but the city has been repeatedly attacked by Boko Haram Islamists.